An outlier of Canadian cartooning history – a lilt with song and adept at funny-animal hijinks – returns to print with this collection of Neil the Horse, the antic comic book that ran from 1983 to 1988. A nostalgic throwback to the era of movie musicals, fast-talking screwball comedies and adventure comic strips, the series revolves around Neil, a gangly limbed and guileless equine, drawn in the manner of early Disney critters such as Horace Horsecollar; his cynical sidekick, Soapy, a cigar-chomping cat; and their friend Mam'selle Poupée, a wooden doll with a pneumatic torso and Dolly Parton perm. A thick-skinned but heartsick romantic, Poupée lends depth to the trio's slapstick capers, given to dance to express her emotions (including one fleet-footed sequence with Fred Astaire himself, complete with sheet music), and devoted to haute couture to convey her personality (think Katy Keene pin-ups, designed by Katherine Collins's collaborator Barb Rausch). Collins concludes with a heartfelt afterword that details why she's maintained a distance from cartooning since 1993, when plans for a musical, cartoon and graphic novel all fell apart, in the midst of her transition from male to female. 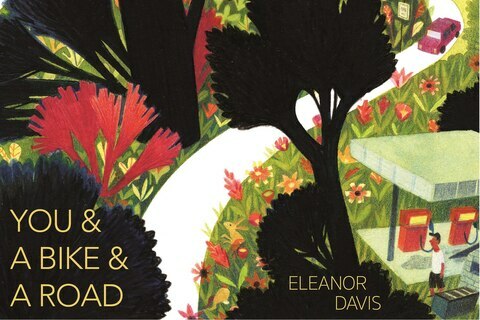 "I want to bike fast and draw beautifully," Eleanor Davis says partway through You & a Bike & a Road, at a point when she's having trouble doing either. You wouldn't know it from her slick, quick drawings that decorate the pages of this travelogue, which tracks her attempt at a bicycle tour from her parents' house in Tucson to her home in Athens, Ga. The artist cartoons her trip with the vigour and precision of a talented athlete, wringing simplicity and beauty from bodily exertion. Without the hindrance of panel borders, barrel-chested figures and minimalist vistas dance across the pages. Davis's linework enjoys a Zen-like freedom similar to the liberation she finds on the road, although she's reminded, relentlessly, that not everyone feels unrestrained under the big skies of the desert U.S. Southwest – one harrowing scene depicts the attempted lassoing of an undocumented man fleeing a car wreck through a Texas canal. As often as Davis punctuates her view with picturesque bunches of shrub mesquite and hardy flora, she's also sure to record the constant incursions from the border patrol, subjecting the landscape to invasive surveillance, rather than tourist soul-searching. In Maggie Umber's entrancing, wordless account of a few months in the lives of a family of great horned owls, no onomatopoeic whooshing of wind, or chirping of crickets, or hooting of owls disturbs her twilit paintings, just as no narration by the voice of God (or of David Attenborough) explains the lives of the animals on page. The pantomime – acted out at dusk, in lambent tones – makes the wilderness almost extraterrestrial, authentically divorced from any human sphere of reference. Certain sequences stand out, as when Umber parallels the embryonic development within an egg alongside the phases of the moon, or when the owls are on the hunt, swooping on prey. But rather than seizing on such significant moments for the birds, Umber excels at the more difficult task of entering into the rhythm of life in the wild, creating a kind of time and awareness that obeys no clock but the moon or the seasons. Her thrillingly inventive approach to cartooning constitutes an act of real empathy with the earth, an attempt to embrace the alterity and sovereignty of the sentient life that surrounds us.